Seriously. I cannot believe the amount of candy we wound up with yesterday. Add it to the remains of our Valentine's Day stash, and our poor candy bin on top of the fridge was overflowing. So? Big Sis is getting this for lunch. In the Peep's wrapper: turkey sandwich. Skittles wrapper: cheddar cheese. 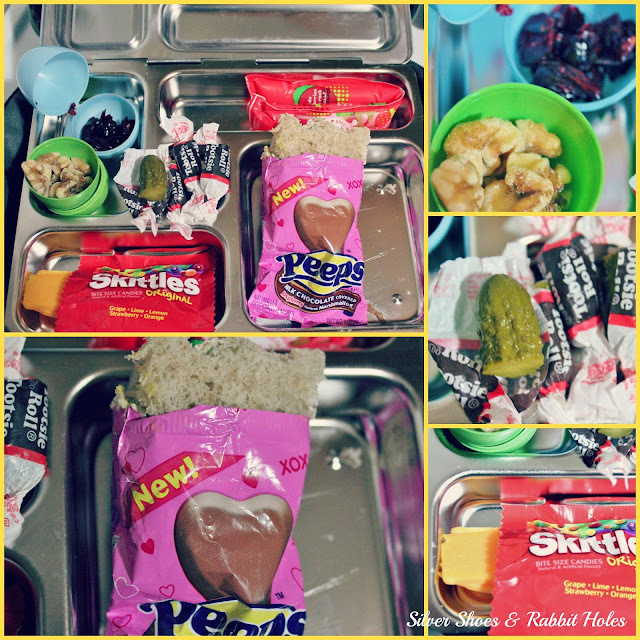 Tootsie Roll wrappers: gherkin halves. Easter eggs: walnuts and Craisins. The yogurt's just yogurt. The fact that the next day is ApRIL FoOl'S dAy!!! My mother-in-law gave the kids SO much chocolate, I don't even know what to do with it all!! Oh my heavens!!! That is the greatest lunch I've ever seen. I'm always the fool on April Fools. It just comes to quick and I'm not good at preparing anything before hand (hence it's my turn to post today and I just finished writing the post before I published) Maybe one day I'll be on the ball enough to pull something like this off! So funny! I wish I could see her reaction! I love it. I'm not the funny one. My husband and youngest kiddo are the quick-witted ones. I was so proud of myself when I made this last night. My husband even posted the pictures on his Facebook. "Look what Danzel did!" :o) I pick her up from school in 30 minutes. I can't wait to ask her about her lunch! This is AMAZING!!!! All I've been reading on FB is how to Get Rid of the Evil Candy. Like, people are losing their freakin' minds. Oh for heaven's sake. It's not like kids eat this much candy everyday! 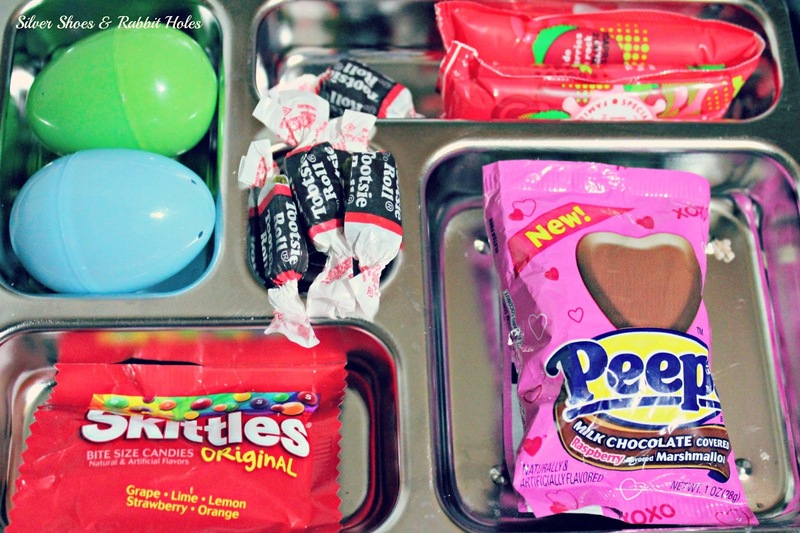 I love that you celebrated the candy pile and made a lunch like this! She'll prolly always remember that you did this for her! In April Fool's News, my daughter told me there was a spider in the laundry pile and I TOTALLY BELIEVED HER. She laughed and laughed! Heehee, I love it! Did she fall for it? April Fools day is awesome (my daughter and I put salt in the sugar bowl and boy oh boy did my husband get a surprise when he sipped his morning tea, haha). Fabulous! I'm afraid of doing that one, because I am seriously the type of person who would forget about the joke, and I'd wind up using the "sugar" myself. I'm very absent-minded, especially in the morning! Big Sis fell for it, she said, until she picked up the first item. She was disappointed, but she thought it was funny enough to tell everyone about it the rest of the day! That is so AWESOME!!! We sort of forgot about april fools and there was no school so no pranks here. My friend's daughter glued a vase to her sister's sheet though--- that was quite unfunny for mom. April fools may be outlawed in their house now.